Design Considerations for Powder Metallurgy: Overcoming Tolerances. For engineers and purchasers interested in a switch from traditional machined parts to powder metal (PM) parts for their next project, there’s often one hangup. Can you achieving the tight tolerances you believe are critical to your product? Although tolerances are of the utmost importance in some manufacturing projects, in most cases the ability of powdered metal parts to cut costs and improve efficiency far outweigh any perceived negatives. More and more manufacturers are finding that designing for PM manufacturing isn’t as restrictive as you’d think -- as long as they keep in mind these specific design considerations for powder metallurgy. Most small parts producers use multiple quality control techniques during production to achieve the desired end product. Let us know if you have further questions about how your powder metal manufacturer can work around tolerance considerations. Although powder metal components can be held to closer limits than you might think, tolerances should still be as liberal as possible. In most cases, however, the benefits of powder metallurgy you’ll see below are a worthy trade-off for the inability to produce super-tight tolerances. 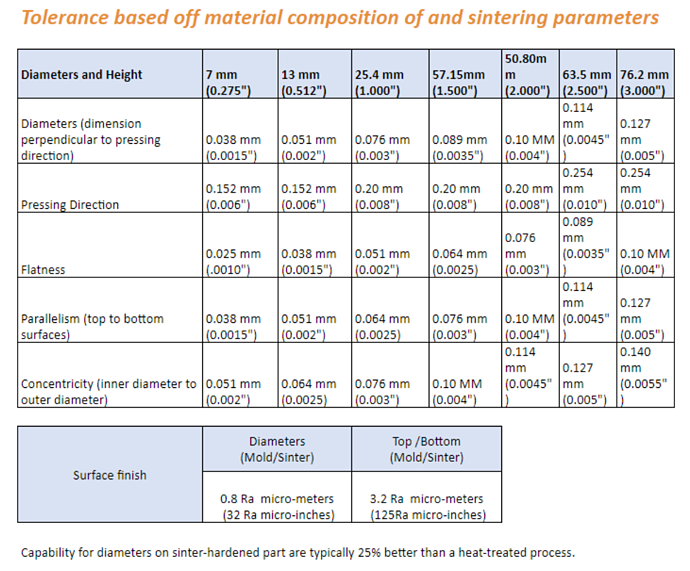 The following tolerances are based on material composition and sintering parameters. Capabilities for diameters on sinter-hardened parts are typically 25% better than those of a heat-treated process. Note that, for example, to have a capability of 1.33 Cpk, you need to have 0.008” (8/1,000th) tolerance. To reduce that, you may need a repressing operation or a machining operation, and so on. All of those secondary processes add to your total cost. Its ability to act as "batter" rather than a "cookie-cutter" material helps powder metal produce a net shape part free of material waste. Still, the process may not be ideal for certain projects that absolutely demand close tolerances. 1. Are You Exaggerating Your Tolerances? Consider whether tolerances need to be as tight as you think. There’s a vast difference between a design that looks great on paper and something that can actually be manufactured cost-efficiently. Asking your powder metal parts manufacturer for highly precise tolerances when they’re not necessarily required can result in higher cost. Does your product really need the tight tolerances of a machined part? Or can those tolerances be relaxed so you can go with the powder metal process? 2. Are the Benefits of Powder Metallurgy Worth It? Better turnaround time, which leads to reduced labor and production costs. 3. Are Your Tolerances Hurting Your Bottom Line? In most cases, tighter tolerances result in higher prices due to the need for more secondary operations, as well as more tooling wear and tear. To make this decision, your parts manufacturer should be a partner in defining your application and your manufacturing processes and materials. That gives the manufacturer a good start on figuring out whether powder metallurgy is right for you. Stainless steel materials sintered at higher temperatures are a good example. Specifying one of these materials could require a tolerance 3x higher than needed with a iron-copper-carbon (FC) material. This applies to both diameter and length tolerances. Another example is heat-treated parts, where you can dramatically reduce tolerances for a sinter-hardened material as opposed to a heat-treated part. In most cases powder metallurgy offers the capability to deliver a net shape part, with no or minimal machining. The end part turns out exactly as you envisioned it on the drawing board. That doesn’t necessarily mean you should burden your small parts manufacturer with unrealistic expectations on tolerances. The right balance of precision and cost-efficiency is usually the best route to a winning PM project.